Dimensions H x W x D 30cm/12" x 19cm/7.5" x 24cm/9.5"
Ever since my first experience with an early version of the Triangle Titus I have been hooked to that sound. It is a bit difficult to articulate all the whys and wherefores, but I am convinced it has a lot to do with the fact that there is no crossover on the mid/bass driver. The increase in the naturalness of instruments and the responsiveness on transients made an instant believer out of me, and I have not lost that religion after all these years. The major downfall with that first speaker and the subsequent model was the tweeter. It sounded fairly detailed at low levels, but started to sound harsh at moderate levels and occasionally was unbearable at high levels with certain upstream gear and recordings. Also, the under-damped cabinet could occasionally be accused of sloppy bass response. The bottom line was - that tweeter just had to go! What if someone designed a speaker with no crossover on the woofer, but with a better tweeter and a bass response that was tight if not more extended. Enter the Reference 3A Dulcet, beguiling me with such promises. 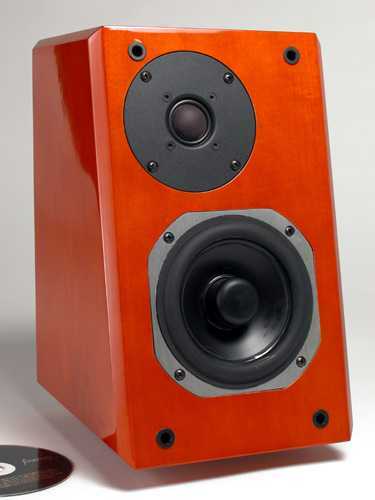 Actually, all of the Reference 3A models are built without a crossover on the mid/bass driver. It is the central premise to their speaker design philosophy. But as always, I will interject caution to you and myself, that expensive and/or fancy designs and materials do not guarantee a better sounding product. In my books, there are only two ways to determine the sound quality of a component. The better of which is by a battery of tests and measurements that are far beyond the scope of the resources at my disposal, and lesser approach being simply comparing by ear to product peers. I obviously can only provide you with the lesser and latter approach. I do have my ususal complaint about the gratuitous [my belief-AK] pair of binding posts and fancy-schmancy jumper between them. But I have already ranted on this before, and will spare you the agony. Overall, I quite like the unusual profile...even if it does look a bit like Darth Vader's head. Dulcet vs. Dynaudio Contour 1.3 MkII When discontinued, this Dynaudio retailed for $2400 USD and has been one of my references for several years now. Contrary to their stated specs, the Dynaudio seemed to play louder than the Dulcet by about 2-3db for the same level on the pot. The Dulcet was much more open sounding; the sound projected free and clear of the cabinet. The Dulcet also had better transient response. The Dynaudio had better bass extension, making some transients sound more impactful. The drivers on the Dulcet were impeccably integrated, even sitting two feet away it seemed like a point source speaker with no difference in tonality between the tweeter and woofer. In direct comparison, the drivers on the Dynaudio were easily distinguishable and the sound obviously emanated from two distinct points. The Dulcet also was relatively better at dynamics at low and high volume levels. HF detail was about same in both speakers. The Dulcet had better dynamics at low volumes and was a bit compressed at very high levels, relative to the Dynaudio. There was definite and audible turbulence through the Dulcet's port when the double bass was played at higher volumes- stuffing the port with a wad of cloth completely eliminated this. Other than that, the Dulcet pretty much cleaned the floor with the Dynaudio. The Dulcet was much nimbler on transients. The Dynaudio was more extended in the LF, but sounded relatively slower and plodding. Also, as discovered earlier the Dulcet seemed like a point source with perfect integration between drivers. The Dulcet was head and shoulders better on male vocals. Everything that is magical about crossoverless designs was evident - naturalness of acoustic instruments, detail, micro dynamics and tonality. At moderate and high volumes, the turbulence generated by electric bass was the undoing of the Dulcet, it was chuffing like the little engine that couldn't. Again, stuffing the port helped eliminate that issue. The Dulcet won out hands down, like it did earlier with male vocals on the "Cheek to cheek" track. Again, the Dulcet won out hands down, like with male and female vocals in tests above. In comparison to this much more expensive Dynaudio, the Dulcet's only serious shortcoming was the audibility of port turbulence at moderate to high volumes. Much more excusable and not surprising, was its relative lacking in bass extension and dynamics at high volumes. Actually, the big surprise in this comparison was the fact that in all other aspects it proved to be a much superior performer. Dulcet vs. NHT Superzero I purchased five of these for my Home Theater a few years ago, at a closeout price of about $80USD a piece. For kicks and grins, I wanted to see how the NHTs would compare to something at ten times the price. The Dulcet was a fair bit more detailed in the treble than the NHT. Almost silly to even point out, but the deeper bass response of the Dulcet was more than obvious. Again, the Dulcet had better LF extension, but also was a bit better on handling dynamics and transients. Nothing surprising, one could easily predict that outcome just by visually comparing the size of the two boxes. The NHT relatively had a bit of glare in this female vocals test. The NHT also was a bit constrained sounding; the presentation was not as open and "free-of-box" as the Dulcet. Same results as the "Afro - freestyle skit" track. The experience on this test for male vocals had about the same results as on the female vocals tests, but the Dulcet also revealed more detail in the midrange frequencies. For some reason it was much more difficult to discern a difference here than on other tracks. The findings were consistent with the "Cheek to cheek" test above, but just the magnitude of differences seemed to be smaller...or it was getting late and I was starting to get tired. In summary, the NHT was a bit constrained sounding and not as open or "free-of-box" sounding. The Dulcet definitely had a much deeper bass response, better detail in the treble, seemed fairly quicker on transients and had much better dynamics than the NHT. But, what may not be obvious from my notes above is how small the differences really were; in most cases it took several tries to hear these differences reliably. The NHT redeemed itself very nicely, for about $80/ea they are great bargain for home theater [Arvind's home theater advice - don't waste big money on audio if your brain is going to be distracted by video, save that money for stereo instead]. Dulcet vs. Triangle Titus 202 This version of the Titus retailed for $500 - $600 before discontinuation. The Titus was my first experience with a speaker without a filter on the mid/bass driver, and I have had it in my stable for the past six years (in spite of significant limitations in the tweeter). I was fully expecting the Dulcet to be at par in the bass and mid frequencies and much better in the treble, let's see what the case actually turned out to be. Only when directly compared to the Dulcet; male vocals are a bit dry and grainy sounding on the Triangles. The transient impact in the HF is much superior in the Dulcet and so is the depth of the bass response (no surprise reading the specs). And lastly, the drivers on the Dulcet are perfectly integrated as also experienced in previous tests above, certainly when compared to the Triangle. The findings here were exactly the same as on the 'Cheek to cheek' test, but the magnitude of the differences were somewhat smaller. The Titus pronounced the sibilance on female vocals to a much greater extent and upper mids in general were a bit sharp sounding. The Dulcet's presentation was smooth yet detailed. The Dulcet drivers again seemed perfectly integrated as if the sound emanated from a single point, in comparison the Triangle distinctly had two sources of sound each with a slightly different sonic signature. The Dulcet also was completely free of grain in the mids, while the Triangle did have a wee bit that was noticeable only in direct comparison. The spectral balance of the Titus seemed more tipped up in the HF region. This can often make a component seem more detailed, without that really being the case. Actually, the tweeter on the Titus tended to breakup and sound a bit harsh at times. The Dulcet had just as much detail in the HF, but was evenly balanced across the spectrum. The only weakness the Dulcet displayed was to compress dynamics in the mid and low frequencies when asked to play at high volumes. The drivers on the Dulcet are perfectly integrated and the sound is projected cleanly and free of the box. Only in direct comparison did I realize that the Titus lacks in these areas. The Titus is still a great speaker in my books and will likely stay in my stable for a while longer; however the Dulcet fully justifies the extra $1200 for what essentially is the same concept. The Dulcet races ahead of the Titus in terms of bass extension, distortion free response in the treble, balanced spectral response, imaging and lack of grain in the mid/low frequencies. The Titus was better than the Dulcet in terms of efficiency, dynamics at high volumes and lack of port turbulence. The previously reviewed Europa retails for $1350-1500 USD, and has a tweeter that has impressed me more than any I have ever experienced. Male and female vocals registered relatively a bit thin sounding on the Jupiters, while the Dulcets sounded full bodied and natural. Males vocals had about the same results as on the track above. Again, female vocals sounded relatively a bit thin on the Jupiters; whereas warmer, richer and more natural sounding on the Dulcets. On the HF notes the tweeter of the Jupiters had much more detail and was fairly more open sounding; all without sounding the least bit fatiguing, I still maintain it is the best sounding tweeter I've ever heard. Only through direct comparison, the treble performance of the Dulcet seemed to have a bit less detail. Notes in the mid-bass region were fair bit boomy through the Jupiters, but with noticeable more bass extension. Whereas the Dulcet was tight and fast sounding in the LF, and the sound was as free-of-box as I've ever heard. But again, the Achille's heel of the Dulcet made its presence known, port turbulence was fairly audible. The Jupiters obviously had a superior tweeter. Keep in mind the Dulcets are not fitted with a slouch either, both tweeters were equally smooth and non-fatiguing but the Jupiters just had a bit more detail. The Jupiters did also offer deeper bass extension, but at the unacceptable price of poor damping and boominess. In contrast, the bass response in the Dulcets was exemplary in all aspects but sheer extension and port turbulence. The Dulcets stole the show in all other regards as well; imaging, transients, driver integration, mid-range detail and naturalness. Dulcet vs. B&W 805S The previously reviewed B&W 805S; retails for $2500. The Dulcet performed considerably better on a couple of aspects. The speed and impact on the skin and rimshot of the snare was plainly superior. And consistent with other experiences, the Dulcet projected male vocals in a "free-of-box" manner that was eerily unbelievable. There is lots of sibilance on this track. The sizzle was unbearable when played when played via the 805S; whereas, the Dulcet played out a smoother reproduction without losing detail. The Dulcet also sounded way more natural and "free-of-box" on male and female vocals. For some reason the Dulcet faltered significantly on this track. The B&W handled the macrodynamics of male vocals without issue, whereas the presentation from the Dulcet seemed a bit compressed at high volumes, in comparison. The B&W also rendered the slight echo in the recording venue with a bit more detail and realism. The shortcoming of the Dulcet on this track is something I have not been able to dissect to my own satisfaction, but it seemed like distortion or breakup in the tweeter at several instances. This was very uncharacteristic with all the other comparisons and tests. The performance of the two speakers was virtually indistinguishable on this track, with the notable exception that the Dulcet once again was able to project female vocals completely "free-of-box". The Dulcet also sounded a bit compressed at very high volumes. The Dulcet faltered a bit here as well; in terms of female vocals sounding a bit shouty, especially when compared to the warm, full and effortless presentation of the B&Ws. The Dulcet was much better on macrodynamics, transients and extended decays of the grand piano in the mid-frequencies at mid-lower volumes. However, the B&Ws seemed to takeover in these regards at higher volumes. Also, the treble notes of the piano seemed much more 3D with the B&Ws. I just could not get over the turbulence issue again; however with the Dulcet's port lightly stuffed this became a non-issue. Then, I actually preferred the Dulcet's presentation by a good measure - in terms of "free-of-box" projection and transient speed. Needless to say, the B&Ws dig deeper into the bass region, but not apparently as much as I had expected it to. In a subsequent conversation with Task Goka - I told him that I found the Dulcets to be quite inefficient, a bit compressed at very high volumes, limited in bass extension and port-turbulence was audible in some instances [but absolutely love it overall, no joke - AK]. Based on past experience with sharing even slightly negative findings, I have come to expect a certain reaction from manufacturers/agents. My experience so far, is that they are all too eager to agree with my positive findings and think me a genius for doing so, but then I instantly become a moron because they completely disagree with the faults I find. - If the port-turbulence is bothersome, lightly stuff the port. This will reduce bass extension, but will not reduce efficiency. My findings corroborate this. - Development of this design took 2 years and 30 prototypes. There also was heavy scientific collaboration with the University of Waterloo. I suppose this dismantles the NRC's long-standing monopoly of helping Canadian speaker manufacturers develop better designs. - Tash went on at length describing the fanatical attention that was given in choosing the right glues and fastners. The details are not important, but it gives us an idea of how fastidious they are. Tash is convinced that they have to be this way because the lack of a crossover disallows tweaking the filter circuits to make up for shortcomings in other areas. Sorry if you've gotten the wrong impression so far. Especially, since I have picked on a few shortcomings repeatedly in the sections above. I wouldn't be much of a critic, if I didn't criticize (I am not getting on that soap box again). But, all in all, I have been tremendously impressed by this speaker. - Rise and fall of transients are outstanding. Again, better than I have ever experienced before and about tied with the Triangle in the mid/bass frequencies. 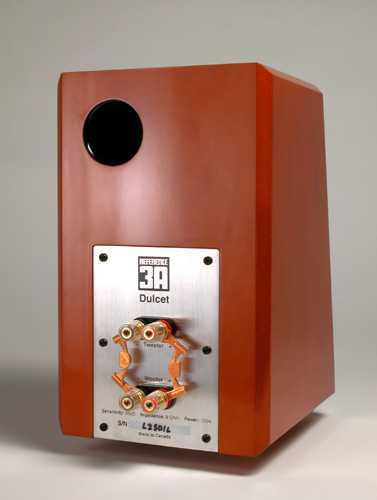 - The Dulcet also was very natural sounding at all frequencies, except compared to the treble of the Jupiter Audio Europas and when it was pushed past its limits (more on that in a bit). - The drivers seem to be perfectly integrated (tonally and spatially), to the point that the sound seems to emanate from a single point...even when sitting about a couple of feet away from the speaker! - Imaging is outstanding and the sound emanates completely free-of-box. I have never experienced it to this extent with any other speaker. Alas, the Dulcet is not the perfect beast and does have some shortcomings. But none of these I consider fatal or without a reasonable workaround. - They were the most inefficient of all the speakers I compared them to. And that is saying a bit, especially when compared to the Dynaudios and Jupiters. But again, a medium-small room is what this product is intended for, where they should suffice for the non-masochistic among us. - Dynamics tended to get a bit compressed at very high levels. This would be a fatal flaw only if you intended to use these speakers in larger rooms and at very high levels. I think that it is unrealistic to expect this speaker to be able to deliver to those parameters; I'd look to their larger models if those are your needs. Thus I give them a pass on this point as well. - Bass extension is fairly limited. But again, this is to be expected from this genre of product and the Dulcet gets a pass on this aspect as well. 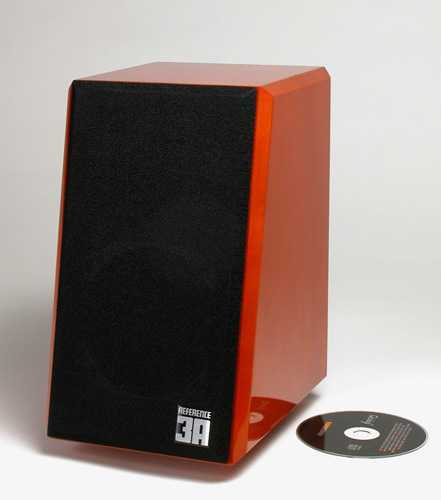 But do plan on using these speakers with a subwoofer if the lower frequencies are of any importance to you. - Port turbulence can be audible at times and distracting with certain types of music. This would be a fatal flaw, except there is a solution. Which is to stuff the port - I used a loosely rolled up piece of fabric. This product is built to excel in specific applications, and does not pretend to be all things to all people. And in its intended setting I have not heard anything like it. I would switch my Triangles out for this speaker in a heartbeat. The only reason I am not replacing my Dynaudio with the Dulcet, is because of the limited dynamics at high volume levels - but outlside of that limitation I consider the Dulcet to be superior in the really important matters. To be perfectly honest, I am so enamoured by what this speaker does well that I cannot bear to live with the Dynaudio anymore...not after I have tasted the sweet nectar of the Dulcet. I believe I have no choice but to further explore other products along the same vein as the Dulcet, before I can make a decision.